Fall into early Winter– a time for drawing in, taking stock, gathering the final harvest, readying home and hearth for what lies ahead in the season of quietude as Mother Earth prepares to rest, restore and show a different kind of beauty, sometimes stark, sometimes barren but beauty none-the-less. What is it that you wish to gather inward during this final harvest? What is it that will carry you through and sustain you in the months ahead? Just back from a glorious journey to Arizona canyon lands, meeting indigenous peoples, learning a little of their culture and history as well as traversing strange but wonderful landscapes, I am basking in the memories of mind and heart with the hope that I can take what I’ve learned to enrich my work. What I encountered was a mix of vast differences and striking similarities and isn’t that the way of it – we are all of one spirit, one energy, after we strip everything away and find our true essence! My traveling buddy, Sally, and I first stayed at the Grand Canyon at the Bright Angel Lodge, where we stayed four years ago. This time we enjoyed a full day tour with “Marvelous Marv”. While at one particular precipice, we were delighted with a visit from a Red Tailed Hawk who chose to swoop down very close to our little band of travelers. By the way, as we drove in the night before, an antelope trotted up to our vehicle as well as several elk. They are not at all shy of people or vehicles! Next stop was Page, AZ and Antelope Canyon where we toured with a bright, young Navajo fellow. He was resplendent in the rich history of his people and the canyon. 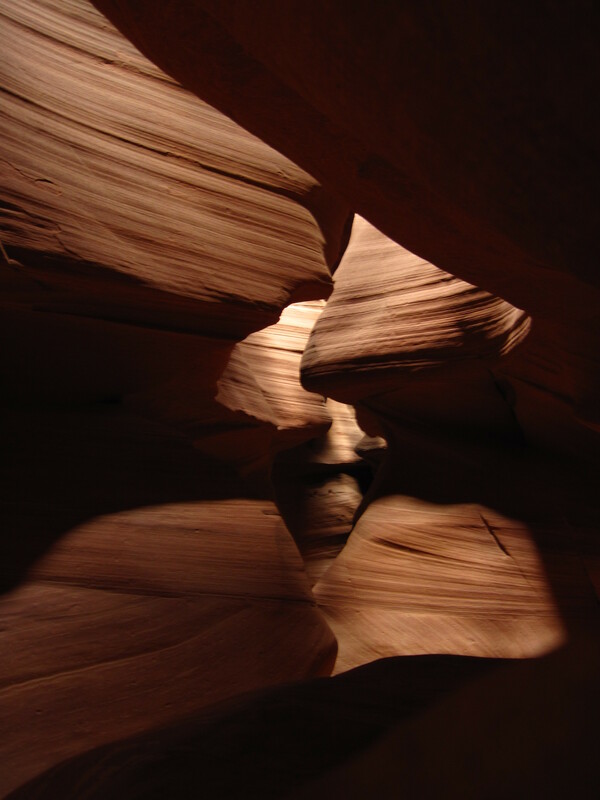 Because he is a photographer, specializing in light play so spectacular at the Antelope Canyon, he offered to assist us with our little digital cameras, novices that we are and then because he is also a Native flute player, he delighted us with haunting flute compositions inside the canyon! He has a CD coming out soon and to be sure; we will be on the lookout for it! Next we traveled to Monument Valley, famous for numerous western scenes and unbelievably breathtaking to behold! We stayed at The View, aptly named with panoramic views of the valley. This hotel is completely owned and operated by the Navajo Nation. We toured remote regions of this land, wandered into caves once occupied by the “ancient ones”, and examined petroglyphs left behind by these people who simply vanished from existence, homes in tact. There is much speculation about what might have occurred. From there we made the journey to Sedona for 6 nights at the Sedona Summit, a very lovely time share of Sally’s where we each had our own suite! While there, we were blessed to spend some significant time with my dear friend, Debra Emmanuelle, esoteric teacher/practitioner extraordinaire! She led us into Faye Canyon where we set our intentions for our time together, and later on, gave us each a polarity session and a class on crystal interpretation. Sally and I spent our days sightseeing, hiking into red rock country and even found a vortex on our own at Bell Rock! There is an unmistakable energy shift from any direction one might enter this beautiful territory. We first arrived driving down Oak Creek Canyon, amazing in its own right and then took our leave driving up that canyon, heading for Hopiland. We stayed at the Hopi Cultural Center and enjoyed delicious native preparations. We were thrilled with a daylong tour with a Hopi who is also an anthropologist and traversed all three mesas; especially notable among them is Orabai, the oldest inhabited native village in North America. Hopi people are living much as they have always lived in this place, keeping the Hopi Way alive and well. We were honored to step into generations old homes of stone and mud to find artisans at work on woodcarvings, katchina dolls, pottery and a host of other crafts handed down from their ancestors. One potter that stands out is an 84-year-old lady, lame and blind in one eye, who hitchhiked from her home on Second Mesa to the cultural center to offer her little pottery bowls. Alas, we didn’t even get her name but we did buy a little piece from her, a keepsake to cherish! While in Arizona, we encountered several representatives from wildlife, in addition to the ones previously mentioned, we also saw a bald eagle, a lizard, ravens, scrub jays, desert sparrows, and much to Sally’s dismay, a snake slithered across our path while hiking in Faye Canyon! I, on the other hand, was delighted to see it! All the while there, I had hoped to spot a cougar but it was not to be. From these snippets, you can hopefully catch a glimpse of the grandeur of our experience. I am grateful and richly blessed for all of it! I extend my grateful thanks to all who have contributed to my life/work, who have graced my life and enriched my days. To view pictures from my glorious journey, please see my photo gallery. As the proprietor of Oakledge Polarity, Patricia Keene teaches Reiki I and II certification classes and provides comprehensive Reiki Master/Teacher apprenticeships. A polarity therapist since 1995, Patricia provides integrated bodywork, including polarity, Therapeutic Touch, Reiki and basic cranial work. She can be reached by email, at (207) 240-9974 or see her web page at http://oakledge.byregion.net, where one can view all information as well as class content and dates.